Sound Community Bank president and CEO Laurie Stewart on the rooftop of the bank’s new Belltown branch, which opened in March. Sound Community Bank offers ITMs and a p2p app, but president and CEO Laurie Stewart isn’t stopping there. She’s fully engaged with technology’s endless potential to make our lives easier. With eight full-service branches and two loan production offices, Seattle-headquartered Sound Community Bank is offering high-tech customer tools that convert banking into an easy, accessible and transparent experience. 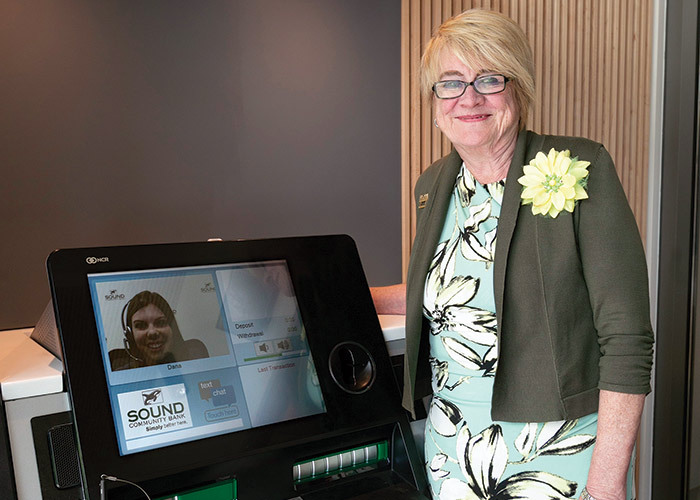 The $660 million-plus asset bank, which converted from a $100 million-plus-asset credit union to a publicly traded commercial bank in 2003, supports interactive teller machines (ITMs) at two of its branches, says Laurie Stewart, president and CEO of Sound Community Bank. Marketers say the self-service video banking machines close the “intimacy gap” by allowing live video interaction with a bank employee. “As we looked at our branch transaction volume, we decided to continue to automate in-branch transactions,” Stewart says. She says the technology has grown so popular that the two employees who worked at an ITM branch on Saturdays now enjoy weekends off. Clients have adjusted easily to the ITMs; Stewart says the same number of customers who relied on staff to process their transactions on Saturdays now use the ITM. Sound plans to roll out ITMs to the remaining six branches. The bank has embraced technology in other ways, too. Several years ago, it installed cash dispensers in every branch. Sound has long offered a mobile app that enables clients to perform functions like making remote deposits or checking their balance. Last year, it added a new person-to-person (p2p) function called People Pay to the app that customers use to deposit money into other people’s accounts—even at other banks—by entering just the recipient’s phone number or email address. Stewart demonstrates Sound Community Bank’s ITM technology with the help of ITM client service representative Dana Fox (on screen). Technology may not be able to keep pace with Stewart’s imagination. One thing on her mind is a big technology gap in community banking: the front end of small-business lending. Since many small business owners need to secure additional capital to grow their companies, she hopes technology will soon be available to automate and expedite the lending process. She can envision small-business owners using the technology on a Sunday afternoon for preliminary modeling to see if a loan is practical for their business. Meanwhile, she says clients sometimes contact her during off-hours. She believes the days of nine-to-five weekday banking are long gone. “Our goal is to provide 24/7 service and we need the help of technology to do this in an efficient manner,” Stewart says. Stewart believes the purpose of technology is to make everyone’s life easier, including employees. So far, back-office employees like Sound Community Bank’s underwriting and IT departments work remotely. She believes the perfect bank combines the best of people and technology. “It’s that perfect marriage of the Amazon model of instant gratification coupled with the Nordstrom model of fantastic service,” she says. She adds that technology also frees up bankers to focus on complicated transactions or advising customers about their mortgage, retirement or small-business needs. Some of Sound’s branches reflect Stewart’s vision. Its new downtown location, for example, doesn’t have any teller lines. Instead, it features a coffee bar, seating area, private merchant area and private consultation rooms. Most days, Stewart walks to work, which is about a mile from her home in downtown Seattle. But some point to Stewart herself as their source for inspiration because of what she’s done in her life and career. A prime example is her participation in a Cure for Cancer fundraiser about six years ago that involved climbing Mount Kilimanjaro. 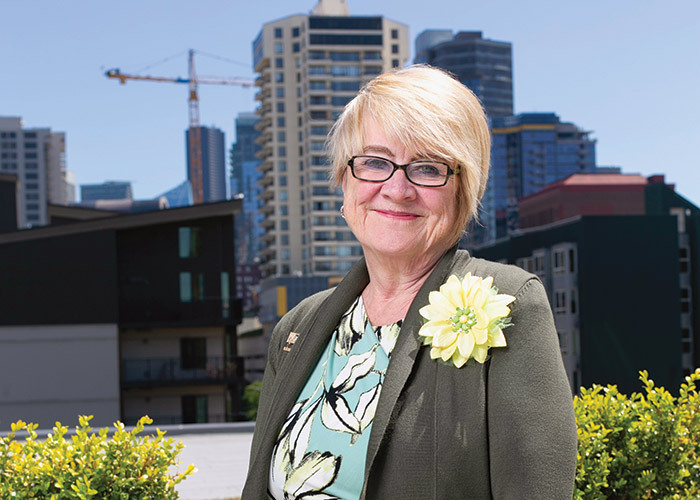 At sea level, she serves on the board of directors for the Seattle branch of the Federal Reserve and was among seven community bankers who met with President Donald Trump last year to discuss regulatory challenges affecting community banks. Stewart says new banking technologies will simply be a “different mechanism for ensuring we make the loans that help our clients and are safe and sound. Carol Patton is a writer in Nevada.